The domain within your query sequence starts at position 300 and ends at position 367; the E-value for the EH domain shown below is 6e-6. 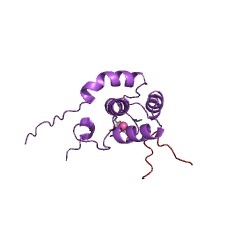 Pair of EF hand motifs that recognise proteins containing Asn-Pro-Phe (NPF) sequences. 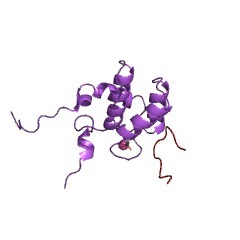 The EH (for Eps15 Homology) domain is a protein-protein interaction module of approximately 95 residues which was originally identified as a repeated sequence present in three copies at the N terminus of the tyrosine kinase substrates Eps15 and Eps15R [(PUBMED:7568168), (PUBMED:11911876)]. 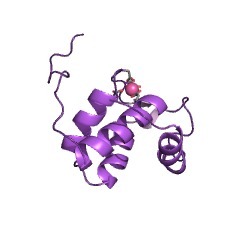 The EH domain was subsequently found in several proteins implicated in endocytosis, vesicle transport and signal transduction in organisms ranging from yeast to mammals. 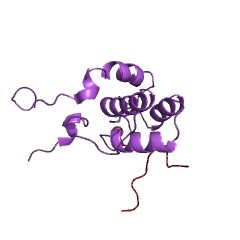 EH domains are present in one to three copies and they may include calcium-binding domains of the EF-hand type [(PUBMED:9397678), (PUBMED:10021353)]. 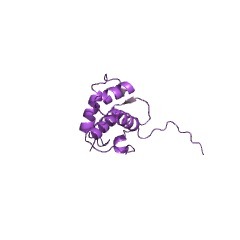 Eps15 is divided into three domains: domain I contains signatures of a regulatory domain, including a candidate tyrosine phosphorylation site and EF-hand-type calcium-binding domains, domain II presents the characteristic heptad repeats of coiled-coil rod-like proteins, and domain III displays a repeated aspartic acid-proline-phenylalanine motif similar to a consensus sequence of several methylases [(PUBMED:7689153)]. 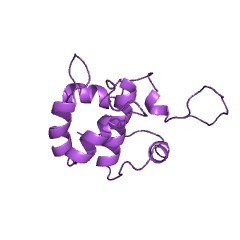 EH domains have been shown to bind specifically but with moderate affinity to peptides containing short, unmodified motifs through predominantly hydrophobic interactions. The target motifs are divided into three classes: class I consists of the concensus Asn-Pro-Phe (NPF) sequence; class II consists of aromatic and hydrophobic di- and tripeptide motifs, including the Phe-Trp (FW), Trp-Trp (WW), and Ser-Trp-Gly (SWG) motifs; and class III contains the His-(Thr/Ser)-Phe motif (HTF/HSF) [(PUBMED:9303539), (PUBMED:9822599)]. 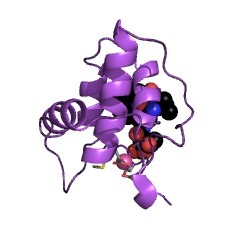 The structure of several EH domains has been solved by NMR spectroscopy. 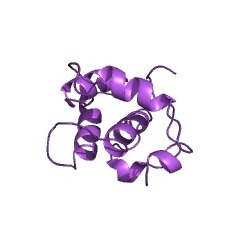 The fold consists of two helix-loop-helix characteristic of EF-hand domains, connected by a short antiparallel beta-sheet. 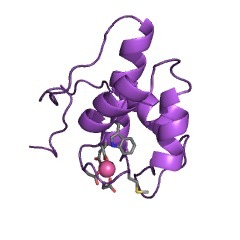 The target peptide is bound in a hydrophobic pocket between two alpha helices. Sequence analysis and structural data indicate that not all the EF-hands are capable of binding calcium because of substitutions of the calcium-liganding residues in the loop [(PUBMED:9721102), (PUBMED:10757979), (PUBMED:11389591)]. 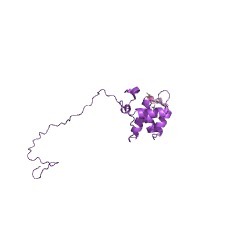 This domain is often implicated in the regulation of protein transport/sorting and membrane trafficking. Messenger RNA translation initiation and cytoplasmic poly(A) tail shortening require the poly(A)-binding protein (PAB) in yeast. The PAB-dependent poly(A) ribonuclease (PAN) is organised into distinct domains containing repeated sequence elements [(PUBMED:1339314)]. There are 17193 EH domains in 9165 proteins in SMART's nrdb database. Taxonomic distribution of proteins containing EH domain. This tree includes only several representative species. 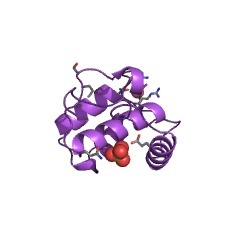 The complete taxonomic breakdown of all proteins with EH domain is also avaliable. Click on the protein counts, or double click on taxonomic names to display all proteins containing EH domain in the selected taxonomic class. 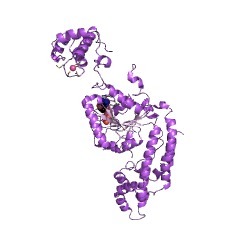 Structure and Asn-Pro-Phe binding pocket of the Eps15 homology domain. 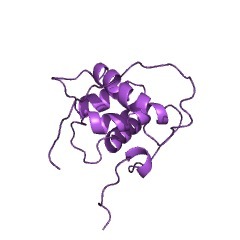 Eps15 homology (EH) domains are eukaryotic signaling modules that recognize proteins containing Asn-Pro-Phe (NPF) sequences. 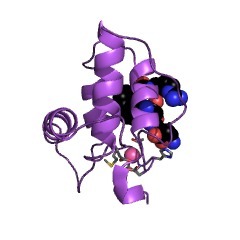 The structure of the central EH domain of Eps15 has been solved by heteronuclear magnetic resonance spectroscopy. The fold consists of a pair of EF hand motifs, the second of which binds tightly to calcium. The NPF peptide is bound in a hydrophobic pocket between two alpha helices, and binding is mediated by a critical aromatic interaction as revealed by structure-based mutagenesis. The fold is predicted to be highly conserved among 30 identified EH domains and provides a structural basis for defining EH-mediated events in protein trafficking and growth factor signaling. Binding specificity and in vivo targets of the EH domain, a novel protein-protein interaction module. 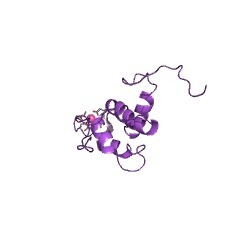 EH is a recently identified protein-protein interaction domain found in the signal transducers Eps15 and Eps15R and several other proteins of yeast nematode. 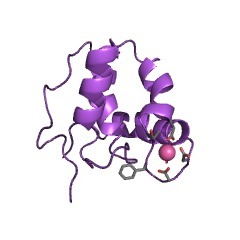 We show that EH domains from Eps15 and Eps15R bind in vitro to peptides containing an asparagine-proline-phenylalanine (NPF) motif. Direct screening of expression libraries with EH domains yielded a number of putative EH interactors, all of which possessed NPF motifs that were shown to be responsible for the interaction. Among these interactors were the human homolog of NUMB, a developmentally reguated gene of Drosophila, and RAB, the cellular cofactor of the HIV REV protein. We demonstrated coimmunoprecipitation of Eps15 with NUMB and RAB. 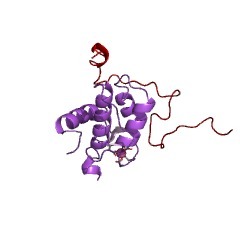 Finally, in vitro binding of NPF-containing peptides to cellular proteins and EST database screening established the existence of a family of EH-containing proteins in mammals. Based on the characteristics of EH-containing and EH-binding proteins, we propose that EH domains are involved in processes connected with the transport and sorting of molecules within the cell. 2khn NMR solution structure of the EH 1 domain from human intersectin-1 protein. Northeast Structural Genomics Consortium target HR3646E. 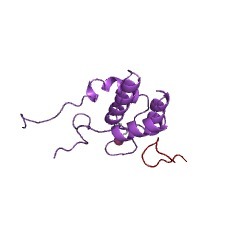 3fia Crystal structure of the EH 1 domain from human intersectin-1 protein. Northeast Structural Genomics Consortium target HR3646e.